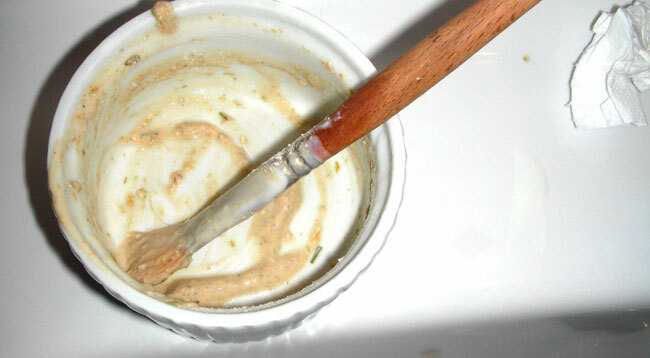 If there was a spoon instead of a brush in the cup above, this might have looked like the remains of breakfast. In fact, it's the remains of an easy peasy peeling mask. Today, we're going to combine chemical exfoliation with flowers, dirt, and food to freshen, tone, and nourish the skin. If you've been reading this blog for a while, you may have already made your own flowers, dirt, and food face wash with your fave ingredients. If that's the case, you're pretty much ready to rock and roll! 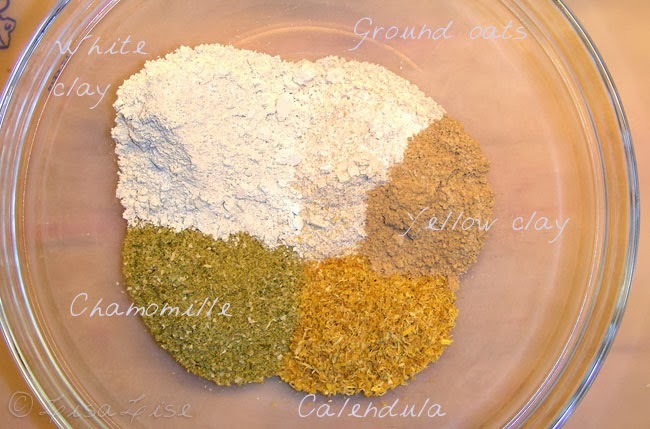 But before we continue, I'd like to thank the lovely María Zamora for leaving a comment on this post about always having pre-mixed dried ingredients on hand for doing a face mask. Your comment was the inspiration for this whole post. Thank you! Pour up the amount of yoghurt you want to use and let it reach room temperature. Add mixture of dried flowers, dirt and food and stir until you have the desire consistency. Sit and enjoy for anywhere from 10 minutes to an hour - whatever you have time for. If the mask starts to dry, remove it. 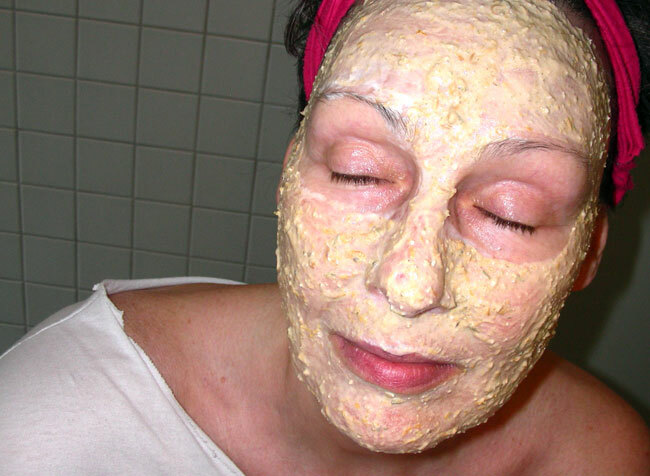 If you've gotten the consistency right, the mask will not drip and will continue to stay moist. I let this mask sit for a full hour and a half - just to see how long it would take for it to start drying (it took about an hour and a half). Here's a shot of the mask after a full hour - still no sign of drying or cracking. Sometimes the simpler, the better, above all with the inmense amount of great natural ingredients we have around us. I'm glad I could help even with this simple Idea. I don't know why but lastly I have a little "coup de coeur" with violet clay, I don't know, it's like a different touch of colour, with the gorgeuous and soft touch of the white clay. I've tried a mask-in-a-minute by mixing 1 tsp of violet clay, 1 tbsp of blueberries (crushed) and 1 tsp of greek yogurt. after my success with honey on my face I went on leave for a week and did not pack honey. Big mistake! I am back to the honey packs and that's when I remembered that I'd bought some honey powder a long time ago and since I already love the dry mixes for face and body I started experimenting with a honey-to-go face mask/exfoliater :-) The honey powder, though packed carefully, really showed that it is a humectant and had turned into a hard little rock but the blender took care of that. My first batch is ground oatmeal, honey powder, orange peel powder and white clay. I am happy so far. I am wondering about making a cream with the honey powder, would it be sticky? Guess I'll have to give it a try. Have you used honey in products, or what about propolis- I have seen that in creams too. Hi Tina, I'm glad the honey is working well for you - I even use it on my hair (when I know I will be getting into the shower afterwards!). As for using powdered honey - yes indeed I have used this and it is great in emulsions. I developed a cream for a client (who even named it) Good Night Honey, and it keeps getting repeat orders. My skin loves it as well. This formula is with the powdered honey. Note: I do dissolve the powdered honey before adding it to the cream (phase 3 - after the mixture has cooled to under 40 degrees C). There is no stickiness at all. I do know what you mean about the 'lumps' in the powder. I like your idea of running it through a blender to break up the lumps. Thank you for the tips Lise I will have to give a honey cream a try :-) And the hair mask too! Best of luck with it Tina! I made my first tub of honey night cream with fresh honey and Vitamin-A. Did I mention that a friend of mine gave me some safron? I read that safron is good for your complexion so I let a bit of safron steep in the water while it heated. The cream has a nice yellow color and an OK consistency, though I think I'll lower the amount of honey because my skin feels just a little bit sticky after I apply it, the warm summer weather could have influenced how it feels too. I am thinking of adding sal butter to the next batch. Have you heard of safron in cosmetics? And do you have a favorite emulsifier? I have tried Olivem 1000, BTMS and Oliwax LC. So far I think I like Olivem and BTMS the best but its hard to tell the difference - of course I should try to make the same product with different emulisfiers to compare but if you dont mind my asking? Great input! I'm intrigued by your use of saffron! I've never heard of it being used topically, but will now have to look into it. As for honey: May I ask what percentage honey you used? Did you use raw honey or powdered honey?